Hunting is a passion for many people. It is more than a hobby or a quest for food. It is about being out in nature and following some our most primal urges. It is about the thrill of the hunt. It is about tracking and waiting. It is about leaving the digital world behind and reconnecting with the real world. 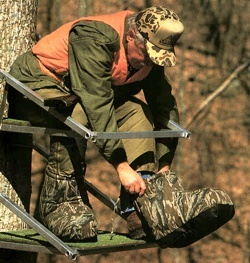 Winter is the most common time for hunting, even in Southern states where it remains relatively warm during this time. In most states, however, hunting is usually associated with very cold weather, and the hunter must be prepared to protect themselves from the weather if they plan on having a successful hunting trip. The most affected areas of the body in the extreme cold are the hands and the feet, with the feet usually suffering the most damage when not properly protected. Hypothermia can quickly set in when hunters find their feet wet and frozen because they are not properly protected. Hunting with warm boots using the The Icebreaker Boot Blanket will help you stay warm and concentrate while hunting. A must-have piece of hunting gear is the Icebreaker Boot Blanket. This boot covering easily slips over your boots and provides two layers of insulation to your feet. The interior panel is made of water-repellent nylon, providing your feet with additional protection from the cold. The top of the boot blanket has a drawstring that allows the hunter to cinch the top closed, keeping out the wind and snow so you will be hunting with warm boots. An additional benefit to these boot blankets is the fact that they are very durable and do not have to be just set aside for hunting trips. You can use these fantastic boot coverings for ice fishing or any other winter time outdoor activity that you participate in each year. Everyone that participates in outdoor activities during the winter understands that cold feet can ruin a day. When your feet become too cold your body will have a hard time staying warm. This usually designates the end to the activity for the day. It is much easier to be prepared for the cold by having the right gear, including Icebreaker Boot Blankets, so that you can remain active and warm during all of your winter time fun. Nothing beats warm feet in the cold.